Central government departments spent more than £1bn on consultants and temporary staff in 2009-10, a report by the Commons spending watchdog says. It said departments should negotiate more fixed price contracts and develop "core" skills among their own staff. And it warned "uninformed" cuts to spending and training could end up costing more in the long term. 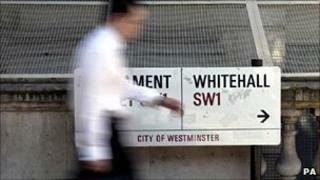 The Cabinet Office says spending on consultants dropped 46% in the months after the election. And in his evidence to the committee, Cabinet Secretary Sir Gus O'Donnell said that spending on consultants, as a share of spending on goods and services, was about 4% - while in the private sector it was about 15%. The report by the public accounts committee says that, in 2009-10, departments spent £789m on consultants and an estimated £215m on interim managers. In 2006-7 £904m was spent on consultants - that dropped by £126m in 2007-8. The report said new measures brought in by the coalition to control the use of consultants seemed to be having some effect but some departments' spending was "unacceptable". It flagged up the Department for Transport, which spends £70 on consultants for every £100 it spends on its own staff while HM Revenue and Customs spent only £2 per £100. A further £700m a year was estimated to be spent on consultants by arms-length bodies, which should be required to report their spending, the report said. It said departments did not control what they spent on consultant, with 70% of contracts based on the amount of time spent on a project, while only 29% were based on a fixed price and only 1% were based on achieving specific goals. It also warned against a "stop-go" approach. It pointed out that the Department of Health appeared to be reducing consultancy spending by 95% in 2010-11 but that Cabinet Secretary Sir Gus O'Donnell was anticipating a resurgence in consultancy spending "as new policies are developed and implemented". Why should the Department for Transport, for instance, be so dependent on consultants? Cabinet Office figures suggest overall spending on consultants dropped 46% in the six months between April and September 2010, compared with the previous year. Ian Watmore, who heads up the Cabinet Office's Efficiency and Reform group, told the committee that the drop was largely due to the number of projects and programmes cancelled by the coalition. But he also thought spending would rise again within the five-year parliament, when new programmes were implemented. The committee said reducing what was spent on consultants "in an uninformed way to make short term gains" could cost more in the long run, adding that HM Revenue and Customs had stopped hiring consultants for six months, which had put an end to revenue-raising tax collection campaigns. And it warned the pressure to save money could mean cuts to training, which would undermine commitments to develop staff skills to reduce reliance on consultants. More work was needed on improving civil servants' skills - particularly in project management and IT, the committee said. Cabinet Secretary Sir Gus said more graduates were being recruited into those specialist areas but the government was at a disadvantage in recruiting senior people because they "can often earn significantly more in the private sector". He said it was also difficult to persuade staff to stay in project management roles "due to a preference for policy related work". Committee chairman Margaret Hodget said Whitehall was "largely in the dark" about whether consultants were good value for money. "There are of course legitimate reasons for a department to buy in specialist skills where they are in short supply internally. But departments have become too reliant on buying in core skills rather than developing them in their own staff. "Some departments depend far more on consultants than others. In itself, that is not surprising. What is unacceptable is the poor understanding of whether the extent of a department's use of consultants is justified by the nature of its business. Why should the Department for Transport, for instance, be so dependent on consultants?" A spokesman for the Department for Transport said it had brought in "new, more rigorous controls which require close examination and approval of any requests to appoint consultants". It said the department had spent £12.5m less in the 6 months to September 2010, compared with the same period in 2009 but added sometimes the use of consultants was "the best value for money option".